THE US MILITARY UNIFORM BUTTONS - The US military uniforms employed two basic type of materials for the buttons in their uniform; plastic and metal. Many of the buttons were left over from World War Two and the Korean war. 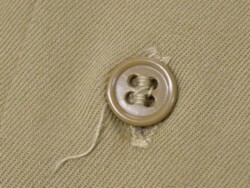 However, as the war progressed and old supplies dwindled, new types of buttons emerged and others were displaced, like the 13-star button which was only used in the early days of the conflict and in civilian purchased clothing. This information is provided courtesy of MilitaryItems.com , providers of military antiques and collectibles. Come and check out our on-line store where we have a large selection of Vietnam war era uniforms for sale. US Army Overcoat Button - Plastic Type. US Army 13-star Metal Button. US Marine Corps Field Metal Button. 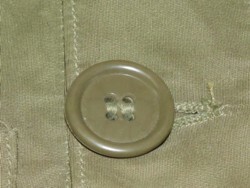 US Marine Corps Field Pants Button. US Army Tunic Metal Button. US Army Air Corps Survival Vest Button. 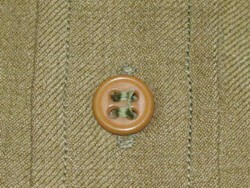 US Army Wool Shirt Button. US Army Summer Shirt Button. You can see more information regarding Vietnam war era military uniforms by visiting our American Uniforms of World War Two special guide. © 1997 - 2017 MilitaryItems.com - All rights reserved.